The Piel Collection of glazed porcelain tile for floors, walls and trim, combines the visual characteristics of distinctive leather with those of weathered, natural stone. The collection was created using rotocolor technology and is available in two sizes for floors (18-inch-by-18-inch and 13-inch-by-13-inch) and two sizes for walls (6-inch-by-18-inch and 12-inch-by-18-inch), with mesh-mounted 13-inch-by13-inch mosaic sheets for extensive design possibilities. 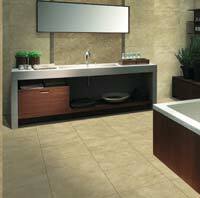 Tiles are available in white, tobacco and mocha.